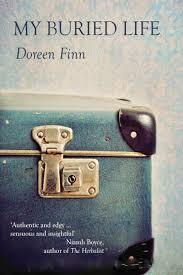 BleachHouseLibrary.ie: #IrishFictionFortnight - Day 14 - "My Buried Life" by Doreen Finn. Feature and Giveaway. #IrishFictionFortnight - Day 14 - "My Buried Life" by Doreen Finn. Feature and Giveaway. Thanks to New Island, there is a paperback edition of this title to giveaway for #IrishFictionFortnight. Just enter via rafflecopter link below. Good Luck! Irish funerals have a way about them. They are an event in themselves. Funeral homes are indeed used, but the further into the countryside you go, the more likely you are to attend a wake. Irish people love a good funeral. The best clothes are brought out, the homemade baking is wrapped in the nicest tea-towels and miles and miles of sandwiches are made. (Mostly ham and cheese, or egg salad). People genuinely want to pay their respects, and must be seen to shake the hand of the bereaved, stand solemnly at a graveside or mention how wonderful the embalmed body looks in the open coffin. There is no malice, just a need to be part of the gathering and there is always a gallon or two of tea to be had. If you do a google search of funerals in Irish fiction you will see some of our nations finest authors there. James Joyce, John McGahern, Anne Enright et al. However, I have read two exquisitely crafted accounts of Irish funerals in recent years. One was Donal Ryan's The Thing About December and the other was the opening chapters of this novel, My Buried Life, from Doreen Finn. Both are set in recent times, both detail the days surrounding death and burial and both describe the reaction of the community to the passing of one of their own. One in a country town, one in Dublin. Donal Ryan uses his character, Johnsie to describe the women of the Irish Country Women's Association gathering in the home of a recently deceased man. "Sure why wouldn't they have been mad about their little crathur, Mother said to Molly Kinsella the day Dwyer died and a few of the ICA biddies had gathered in Johnsie's mother's kitchen to pick at the tragedy like crows picking at a flungaway snackbox." In Doreen Finn's debut, her protagonist has returned from the US to bury her estranged mother. Years of hostility and bitterness have brewed up inside her, and coming home is the last thing she wants. The funeral is described from the eyes of a cynical, tired woman who has not set foot in Ireland for decades and feels nothing at the passing of her mother. "Wet hands press my cold flesh. Murmured words sweep over me, blending in a toneless wash of indecipherable sound. Earth hits the coffin lid. Thwack. I try to focus on the eyes that line up in front of me, jet lag and a headache distancing me further from the kindness and awkward, fumbled mumbles of sympathy and solidarity." What happens when you no longer recognise the person you have become? Eva has managed to spend her twenties successfully hiding from herself in New York. Attempting to write, but really only writing her epitaph, she returns to Ireland to confront the past that has made her what she is. In prose that is hauntingly beautiful and delicate, Doreen Finn explores a truly complex and fascinating character with deft style and unflinching honesty. Josh Ritter, thanks for the amazing giveaways! Please do another themed fortnight, I've really enjoy this one & discovered loads of new authors!